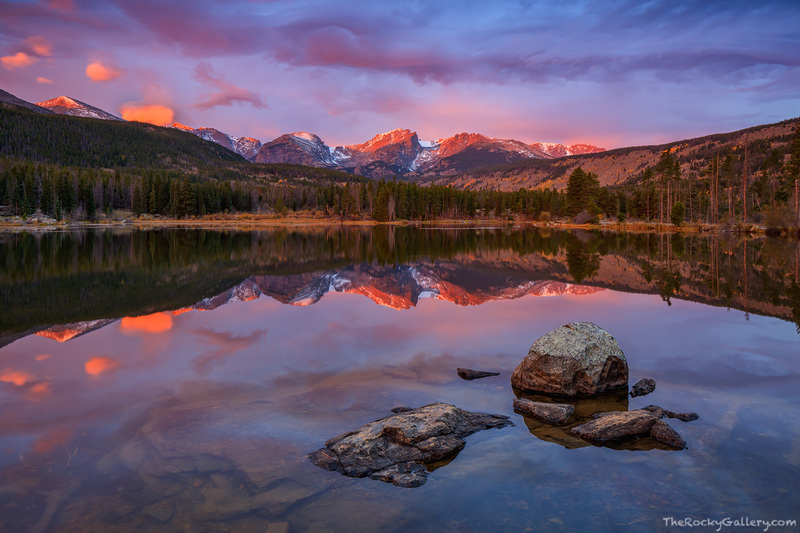 I've photographed many a sunrise from the shores of Sprague Lake and have witnessed some truly beautiful sunrises. This is without question one of my favorite mornings at Sprague Lake. Autumn is slowly slipping away and soon winter will descend upon Rocky Mountain National Park covering the peaks with snow and freezing the surface of Sprague Lake. This morning however at Sprague Lake was nearly perfect. Dramatic colors illuminated the sky over Rocky Mountain National Park and the winds were still and calm allowing for a perfect reflection of Otis, Hallett and Flattop Mountains. Photo © copyright by Thomas Mangan.